Sept. 17, 2009, 8 a.m.
By Zachary M. Seward @zseward Sept. 17, 2009, 8 a.m.
A very quick lesson in search engine optimization: Brent Payne, the Tribune Co.’s head of SEO, whose wisdom I wrote about last week, posted a video yesterday demonstrating a new feature in Google Webmaster Tools. In the process, he offered a brief glance at The Chicago Tribune’s dashboard on the site, pictured above. 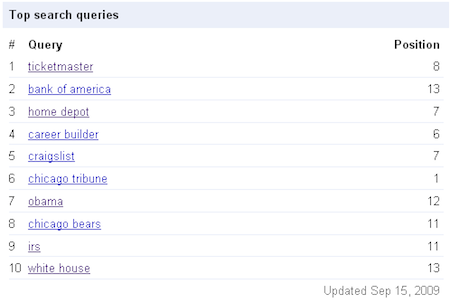 What you’re looking at are the top search queries on Google that return pages from chicagotribune.com. In each case, Google is returning the Tribune’s topic page for the brand, where you get a list of articles that mention the company. (Here’s Ticketmaster, for instance.) Payne speculated that one of Google’s periodic algorithm updates might be driving the paper’s new strength with some of these keywords. Of course, very few people who search for “craigslist” or “home depot” are looking for news coverage of those brands. The traffic those keywords are generating for the Tribune is likely accidental. But the pageviews still count, so whatever work Payne did to rank well for “bank of america” was worth it. POSTED Sept. 17, 2009, 8 a.m.
Seward, Zachary M.. "Newspaper’s top 5 search queries are commercial brands." Nieman Journalism Lab. Nieman Foundation for Journalism at Harvard, 17 Sep. 2009. Web. 20 Apr. 2019. Seward, Zachary M.. "Newspaper’s top 5 search queries are commercial brands." Nieman Journalism Lab. Last modified September 17, 2009. Accessed April 20, 2019. https://www.niemanlab.org/2009/09/newspapers-top-5-search-queries-are-commercial-brands/.